← Harry’s Blanket – Is it a bird? A plane? No, it’s a bunny! A stitch down memory lane. For many years now I have pestered my nan to write down her stories and memories. There are tales of real sadness, joy and intrigue in our family – as with everyone’s – that only she knows in any detail. These stores are all too often lost with the generations. This year, her husband, my granddad, passed away making it all the more significant that ultimately all we have left is memories. The festive season will un-doubtly be hard for her this year but hopefully the little touches that remind her how much we love her and special she is will make it more bearable. I decided as one of her presents that I would buy her a beautiful notebook to write all her memories and stories in. It had to be simple but luxurious (but not expensive!). In the end I found one in Waterstones. A simple brown leather (pleather?) book with splash of colour – the page edges are red. To go with it, I would make a bookmark. My nan has done cross stitch her whole life, and it is without doubt it is from her that I have my love of crafting and baking. It would seem it is a family trait – her grandmother cooked for the King and represented the Southern England WI at something or other (I’ll let you know what as soon as I get the book back from nan!). So it seemed fitting that bookmark be cross stitched. I found some natural white (cream) evenweave in my stack of fabric and a brown embroidery floss that matched the colour of the notebook and started stitching. The first attempt was not successful! I made a mistake and got a knot in the thread when trying to unpick it. I got so frustrated with it, the fabric was pulled and the stitches messy so I decided to just start again. I still made a few mistakes with the second attempt when I wasn’t paying attention. At one point, while I was stitching remember, I realised I’d actually stitched “remb”… Fiddlesticks! Luckily it was the start of the line and in my unintentional wisdom I’d started the word with a fresh piece of thread. So rather then go through the palaver of unpicking it carefully, I simply pulled it all out with my stitch ripper and started that line again. 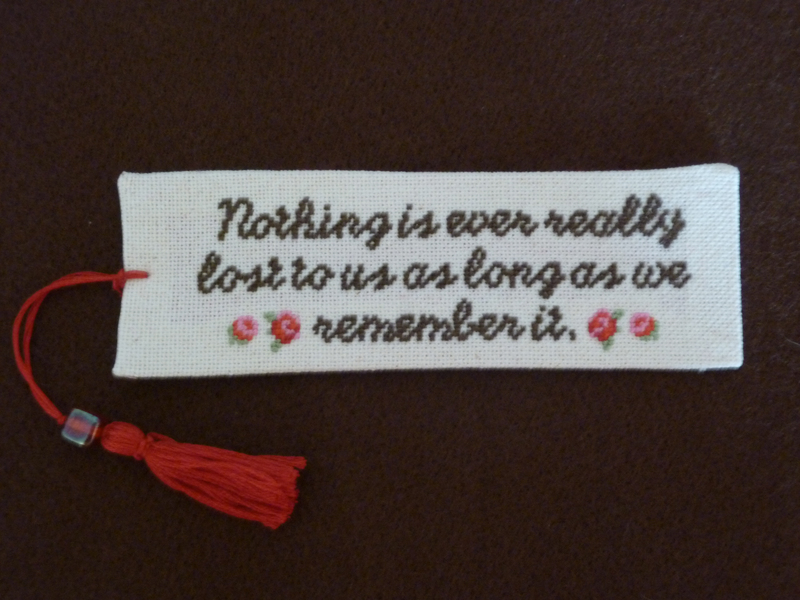 Now the quote was stitched, but it looked a little unfinished so I searched through some cross-stich magazines online until I found a couple of pretty and small rose motifs. I added these either side of the bottom line. The large rose was interesting as I didn’t have it’s pattern in mirror image so had to work it out as I went along. Finally I’d finished sewing! Next I fashioned a tassle out of some of the red embroidery floss, this would be added last. Now, for the assembly. I folder and ironed the edges back using a little wunderweb under the folds to hold them in place. I was backing it in felt, so picked a bright red to match the tassle and book edges. I cut the felt to size and them cut the same size piece of fusion web. It’s just bigger wunderweb so saves you having to lay out strips. One damp tea towel and a hot iron 15 seconds later and just the final touch needed to be added. I thread the end of tassle though an embroidery needle and pulled it through all the layers, knotted and then looped it. I went over the edges and the knot in the tassle with fray adhesive – which is my new favourite thing! And it was complete. My gift to my talented nan – to help keep our families stories alive and remind her that as long as she has her memories of granddad he’ll never be lost to her.